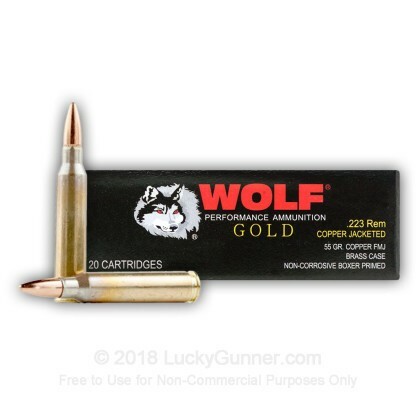 Wolf's Gold line of ammo utilizes brass cases, boxer-primers, and it's designed for reliable functioning and performance! This product is excellent for target practice and hunting. It is both economical and precision manufactured by an established European cartridge producer. 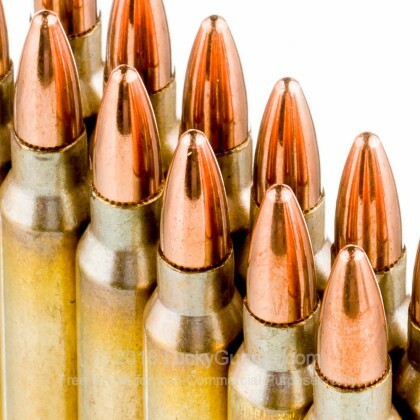 Each round is manufactured in Serbia and has a boxer-primed brass casing, non-corrosive propellant, and a non-magnetic full metal jacketed bullet. Please note that Wolf does NOT recommend using this product with any Smith & Wesson M&P 15 rifles. See the Wolf Ammo website for details. Have two high end AR's and two mini 14's. Junk won't eject from any of the four rifles. All four work perfectly on any other ammo. Don't waste your money! Great little round! It's manufactured to 5.56 standards but at .223 price. Brass casing, sealed primer and bullet, Can't beat it! I will be ordering more. Very good ammo. 200 rounds and no problems at all. Build quality was very good, but the bullets are seated to 5.56 NATO overall length, NOT .223 overall length! Be wary if you have a .223 chamber. I got right around 3 MOA with this load in an entry level AR, which is certainly very acceptable at the price (I get around 2.5 MOA with PPU). The propellant smells really nice too, similar to shotgun powder. I enjoy the FULL experience, smells and all! I had two malfunctions with this ammo, but they were both out of a Kel-Tec PLR-16. I had no issues running it out of my AR's. I'm also not sure if it was user error, more so than the ammo, as the shooter was a first-timer. Amazing Budget .223 Round that has the possibility to outperform 'higher-end' .223 rounds. 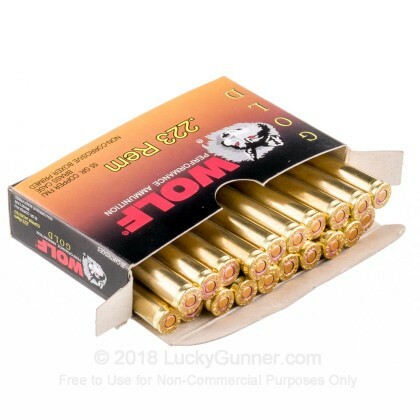 I originally purchased this ammunition for target practice (non-magnetic FMJ are allowed at my range) at 50 yards not expecting too much out of them. Firing two rifles, a Rock River Ar-15 and a newer Late 2013 Model Ruger Mini-14 I noticed a serious difference between how the two rifles fired the round. 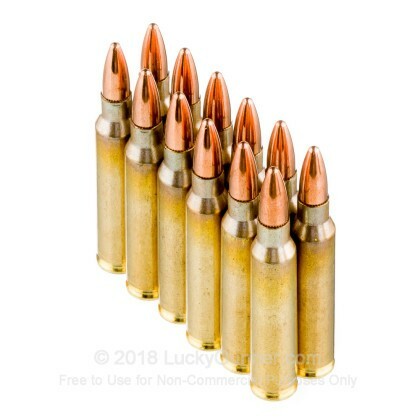 I never had a feed issue with this round, first time buying a sub 50 cents per round brass ammunition without this issue. In comparison to a more expensive round, Winchester Varmint 55 gr, the Rock River AR-15 seemed to enjoy the Winchester round a little bit more. 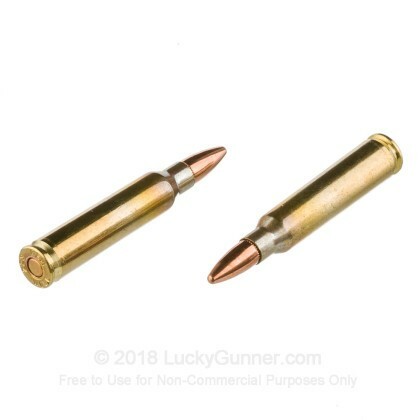 The Mini 14 however was shooting half-inch groups at 50 yards when it's rated at the best to do about 9/10 inch groups at 50 yards with the Wolf ammunition, the Winchester ammunition was shooting less accurately. My friend's mini-14 though (older 2005 model) seemed to like the Winchester more. Researching, I found the chamber pressure is a 9:1 ratio in the newer model and is much less on the others, and the barrel is slightly longer, meaning this Wolf ammunition prefers higher chamber pressures and 18 inch barrels in comparison to the other two which had 8.5:1 pressures and 16 inch barrels. The .55gr round seems to pick up better at higher velocities than the Winchester ammo did. I'd have to investigate this more but the Wolf ammunition might be the best choice for someone with a newer generation Mini-14. The one complaint i have with this ammunition is that it produces more powder in the barrel and the magazines need cleaning more often as well from this issue. Such a small cost for such big benefits in my opinion. 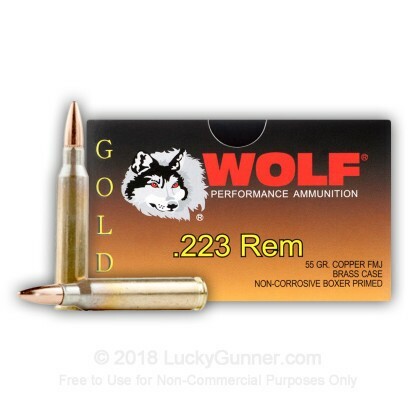 We also have this 223 Rem - 55 Grain - Wolf Gold FMJ - 1000 Rounds ammo in stock in a bigger quantity.